One after the other the rumbling sound of the waves remained on a continuous loop. Each time, a blast of sea water splashes violently towards the natural pool where our group were dipped soothingly. The sight and sound may appear perilous but the magnificent rock formations jutted from underneath the sea, sheltered us safely from the torrents of the Pacific Ocean. 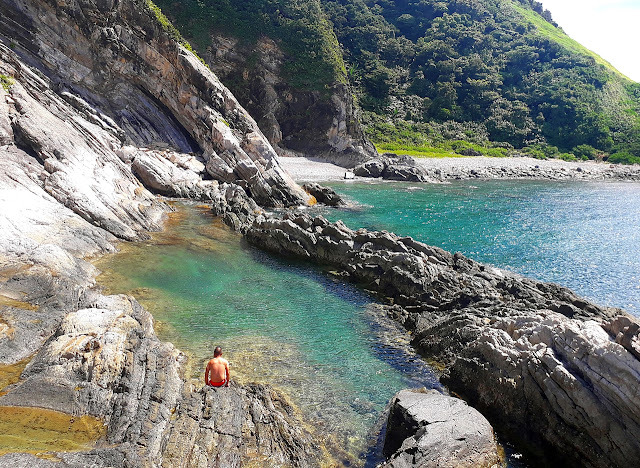 Such is the lure of Tuwad-Tuwadan Lagoon, a secluded tidal pool situated at the foot of Cagnipa Hills facing the monster swells of the Pacific. 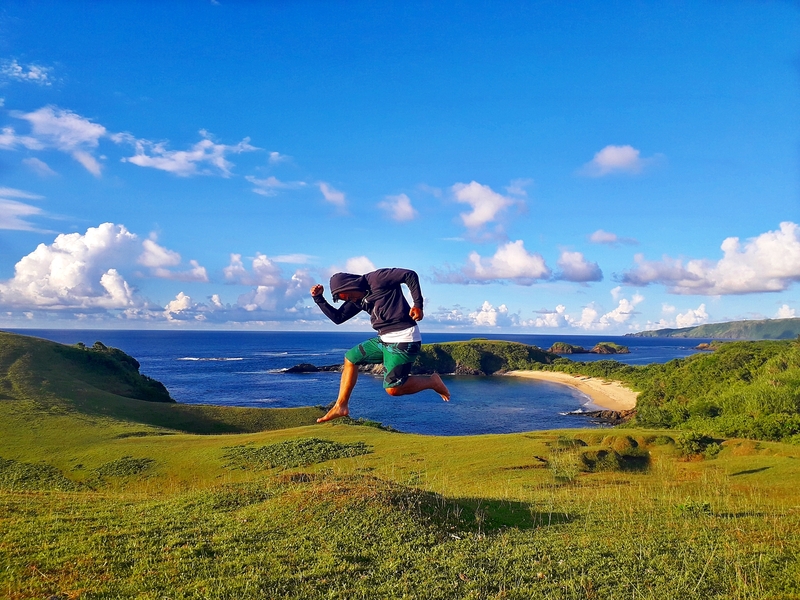 Barely 24 hours after arriving in Catanduanes I already sensed the reason behind its moniker “Happy Island”. The stunning landscape quickly shifting from pulverized white sandy shores to rolling lush hills had me instantly comparing it to Batanes. As our boat circles the northern tip of Catanduanes, and I caught the sight of the uneven slopes of Cagnipa Hills, I felt committing a tinge of betrayal by comparing the island to another province. Despite loving it at first sight, I intuited the need to further explore this province and with only a day under its spell, I let the experience simmer me with exuberant discovery as we move along. 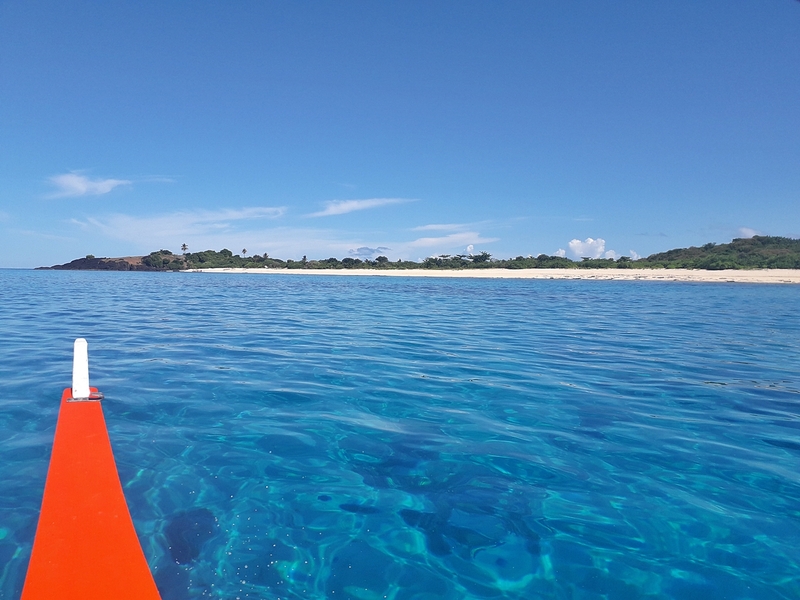 Our first destination was the dual nature wonders of Tuwad-Tuwadan Lagoon and Cagnipa Rolling Hills. A short 20-minute hike took our group atop a waving hills gifted with a fabulous 360-degree picturesque view of verdant fields, scattered islets and the azure colored Pacific Ocean. Following a narrow trail led us to a short route of man-made stairs leading to the aforementioned Tuwad-Tuwadan Lagoon. Like a knife cutting through flesh and exposing a wound, the tidal pool widens into a tadpole shaped loch filled with sea water and obscured from the main ocean, by the jagged rock formations chiseled through thousands of years of swell battering. Running barefoot over the soft grassy knoll of Cagnipa to taking a dip at the immaculate crystal clear waters of the lagoon, had me feeling blessed just by witnessing these twin marvel of wondrous nature creation. Floating and wading for an hour, and while staring at the distant iridescent expanse of fiery sky in the midst of sunset, I rested to a beautiful thought of seeing more of the happy island the next day. 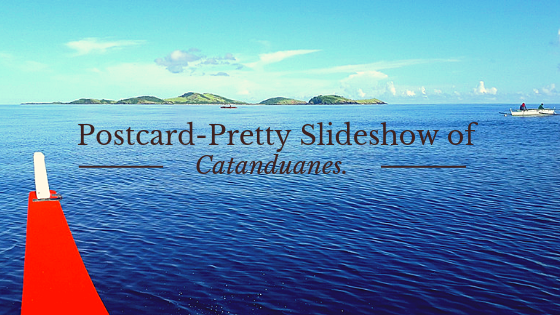 Exploring Catanduanes is almost similar to viewing a slideshow of pretty postcard images. You get the feeling the next slide will amaze you more. Catanduanes followed up our amazing first day jaunt with another curtain dropper of a show. Starring the islands composed of Calabagio, Palumbanes and Tignob, we hopped on another boat ride and into these stunning locations that served as isolated settings for a number of “Survivor” reality TV series from different countries. We first stopped at the boomerang-shaped islet of Tignob. Edged by a rocky hill and stretched around by white sandy shore surrounding a lush green center field and partially forested tip, its surrounding waters hid a wealth of enormous colorful coral reef system. Ensnared by indigo waters, I joined Sara – a fellow writer, in snorkeling the sea to catch some sight of the underwater gems. A strong current forced me into the rocky part of the island and struggling back to the water I happened to stepped over a protruding shell fossil sharp as a razor’s edge. I stumbled back to the beach unaware of the cut on my foot. With blood dripping openly, I saw spills of red mixing with the cerulean waters. It was then I saw a patch of flesh hanging loosely from my ring toe. Despite its gruesome sight, I set it aside after our boatman applied first aid. With my wound securely patched we cruised away to another island. Another day, another postcard image coming to life. This time, the setting is the village of Carorian. Pressed for time, we skipped the place which our guide described to us as a “Waterfalls flowing from the mouth of a cliff”. Just by her description made me yearning to see it on my next visit. We never regretted our decision though, because upon arriving at Poseidon Rock after a half-hour boat ride, I felt my jaw drop at the mere sight of its twin lagoons. Surrounded by astonishing rock formations and filled with sea water in hues of green and blue, it appears like a mirror reflecting the gloss of the mid-morning sun. Neglecting my freshly stitched toe wound, I wasted no time in jumping into the crystal clear waters. 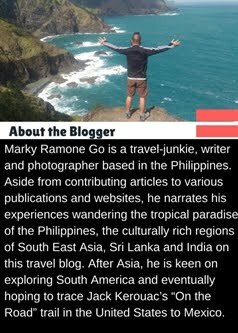 At that moment, I very well knew Catanduanes has shot up into my top three provinces in the Philippines. 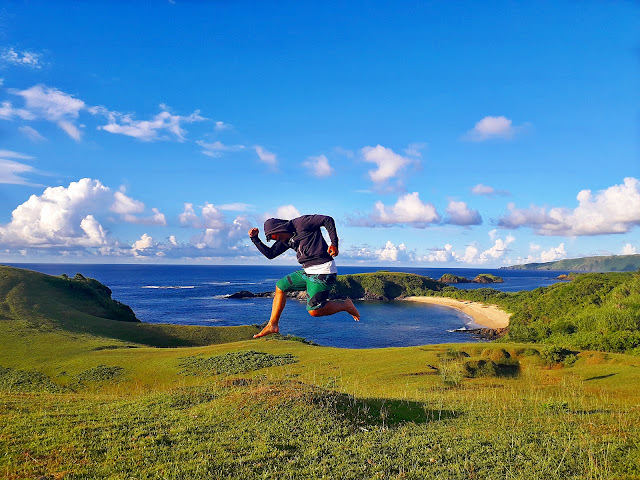 After spending the previous day just chilling under the sun at the surfer haven of Puraran Surf Beach, we capped our almost a week-long journey to Catanduanes with a short hike to Binurong Point. 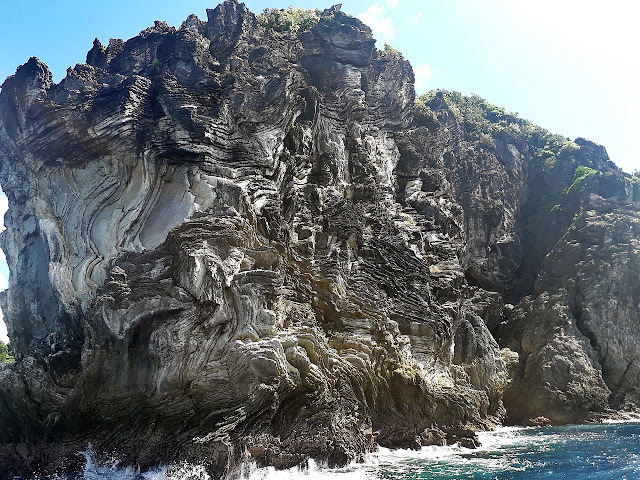 Edged by jaw-dropping cliffs and surrounded by spectacular scenery of the Pacific Ocean and the bucolic countryside of the island, being on top of its many lofty rock platforms gives you a front-row seat to the amazing display of the mighty waves pounding the massive boulders below. Combined with the luster of the sun iridescently against the verdant hills and the gentle whiffing of the wind, sitting on a shade under one of the many giant rocks shall give you a magical place to stay still and contemplate the bounteous beauty of this world.